A Walk from St Ives to Penzance along the Coast Path. 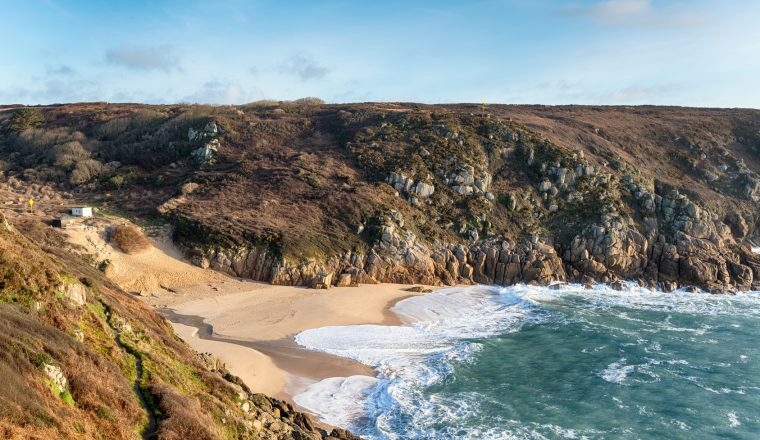 The north and west coasts of Cornwall have a unique atmosphere – a mixture of the charm of St. Ives, famously beloved of artists and home to a branch of the Tate Gallery, to some of the wildest and most dramatic scenery along the entire English coastline. Add to this the wildlife, from peregrine falcons to dolphins, the fascinating mining heritage, the exhilaration of standing at Land’s End, the magnificent open-air Minack Theatre, and the pretty fishing villages of Mousehole and Newlyn, and you have a magnificent moderate to strenuous walking holiday. Total Distance 40 miles / 64 kilometres. £525.00 per person, based on 2 people sharing a room. Supplement for a single person walking alone is £75. Bus far from Zennor to St Ives and back to Zennor the next day. Any day March-October subject to accommodation availability. Day 1: Arrival and first overnight St Ives. This seaside town offers steep streets, great views, good surf and a beautiful light that has attracted artists for centuries. The St Ives Tate Gallery, The Barbara Hepworth Museum and Sculpture Garden are just some of the reasons why St Ives is called the cultural capital of Cornwall. The walk starts out as an gentle walk out of St Ives to Clodgy Point soon becoming a strenuous hike of roller coaster climbs as you walk down towering cliffs into beautiful coves until you reach Zennor, described by D.H. Lawrence as “the most beautiful place, lovelier even than the Mediterranean”. 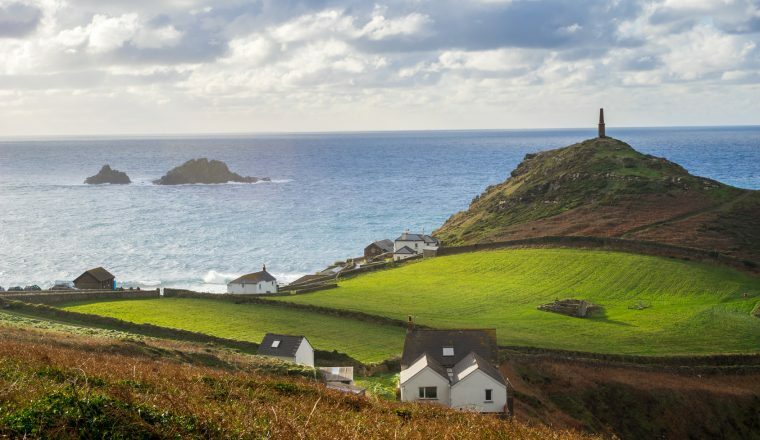 The area around Zennor is designated both an Environmentally Sensitive Area and an Area of Outstanding Natural Beauty. There is limited accommodation here, so you take a short bus ride back to St.Ives for a second overnight here. 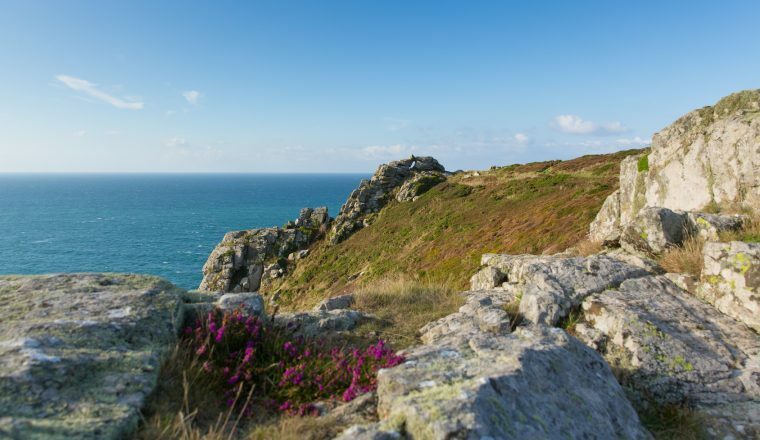 Heading back out to Zennor, the path continues its rollercoaster journey along the coast passing the remains of an ancient settlement and cliff castle at Gurnard’s Head and the site of an Iron Age cliff fort at Bosigran Castle. Seals are often spotted at the secluded sandy cove of Portheras Cove and from Pendeen Lighthouse you can look out at one of the most dangerous stretches of coast (for ships! ), in Britain. The coast path continues to Cape Cornwall, the most westerly point of Cornwall where the Atlantic currents split. This area was is also dotted with the ruins of the once thriving tin mining industry and you can visit Geevor Tin Mine Museum and Heritage Centre at Pendeen along the route before heading inland to St Just for overnight. St Just has a history of farming and mining. It attracts painters and potters and has some great cafes and pubs and a fifteenth century church. The first part of the walk is a mixture of easy open walking along high cliff-tops and short ascents and descents. Walk from St Just to Whitesand Bay enjoying spectacular views, perhaps a view of seals as well as a variety of seabirds such as peregrine falcons, shags, herring gulls and rock pipits, to the lovely fishing village of Sennan Cove with a beautiful beach and great surf. Continue to Land’s End, the most southerly tip of Britain. Continue along the clifftops as far as the open air Minack Theatre (performances May to September). Finally a steep climb takes you down to the idyllic beach at Porthcurno. The path continues – fairly steeply downhill – to the magnificent sands of Porthcurno. A strenuous walk from Porthcurno to the sub-tropical cove of Lamorna. Passing through an Area of Outstanding Natural Beauty, the Path changes quite dramatically as it crosses rugged cliffs, with some difficult ascents and descents, and then turns to easy walking on tarmac through Newlyn to Penzance. The historic association of artists with both Lamorna and Newlyn continues today as the area attracts painters, writers, potters and craftsmen. Overnight Penzance. Depart from Penzance after breakfast. London airports have good connections by rail or bus. us and we will let you know about onward connections from the airports.